• November 9, 1935 Hans Joachim Pabst von Ohain is granted a patent for his latest invention – Germany’s first turbojet design. • Early 1936 Dr Herbert Wagner begins developing gas turbine engines for Junkers. • April 15, 1936 Hans von Ohain is hired by Dr Ernst Heinkel to create a working example of his jet engine. • Circa February 28, 1937 Von Ohain’s first working jet engine, the HeS 1 is completed and installed in a test rig. • Early 1938 Design work begins at Heinkel on an aircraft that can be powered by Von Ohain’s new engine. At Junkers, Wagner begins construction of his own experimental turbojet engine. • Autumn 1938 German aero engine manufacturers Daimler-Benz, BMW, Brandenburgische Motorenwerke (Bramo) and Junkers are encouraged to look at turbojet development by the Reichsluftfahrtministerium (RLM). • December 1938 Messerschmitt receives a contract to carry out feasibility studies for the design of a single-seat fighter with turbojet propulsion. • Early 1939 Junkers’ Rückstoss-Turbinen-Strahltriebwerk (RTO) or ‘Reaction Turbojet Engine’ runs up to 6500rpm on a test stand. It is designed to reach 12,900rpm. • January 2, 1939 Glider designer Alexander Lippisch is transferred from the Deutsche Forschungsanstalt für Segelflug (DFS) to Messerschmitt, after completing the ultimate civilian development of his work on tailless aircraft, Entwurf X or ‘Design 10’, his previous project for the DFS having been the Storch IX or ‘Stork 9’. This was later officially designated the DFS 194 by the RLM. He immediately begins work on modifying the DFS 194 design, originally intended to be driven by a propeller at the rear, to accommodate a Walter R I-203 rocket engine. • January 4, 1939 Heinkel and Messerschmitt each receive a contract to begin work on the design of single-seat fighter aircraft with turbojet propulsion – ‘Jagdflugzeuge mit Strahltriebwerk’. • April 1, 1939 Following preliminary studies, Messerschmitt’s design team set to work in earnest on their first draft of a single-seat jet fighter, project P.65 – later referred to as P.1065. • Circa June 1939 Heinkel begins work on two mock-ups of its projected twin-engine turbojet fighter. • June 7, 1939 The Messerschmitt P.1065 design, intended to be powered by two wing-mounted BMW jet engines, is submitted to the RLM. The RLM asks Messerschmitt to produce a mock-up of the design. • July 1939 Bramo is amalgamated into BMW. The jet engine it has been working on is renamed P.3302. BMW’s own design, the P.3304, is ultimately abandoned. • August 27, 1939 An aircraft powered by Von Ohain’s latest jet engine design, the HeS 3b, takes flight. The Heinkel He 178 V1 is the first jet-powered aircraft to fly anywhere in the world. • September 1, 1939 The Second World War begins. • September 26, 1939 RLM representatives inspect the two completed mock-ups of Heinkel’s jet fighter design. The aircraft receives an official RLM designation – He 280. • October 16, 1939 Work on fitting Lippisch’s DFS 194 with a Walter rocket motor is completed and ground tests begin. It is found that making the engine an integral part of the airframe is a fundamentally bad idea – making it difficult and dangerous to service and repair. • November 1, 1939 The Heinkel He 178 is demonstrated in front of RLM representatives. • December 1939 Junkers begins work on a development of Wagner’s design, the Jumo T1 jet engine design, later known as the Jumo 004. • December 19, 1939 Messerschmitt’s P.1065 mock-up is examined by the RLM. • Circa 1940 Messerschmitt’s designers begin work on a parallel project to the P.1065 – the smaller P.1070 – which has a tricycle undercarriage and its engines mounted in its wings. • Circa spring 1940 The RLM asks Arado to design a bomber/photo reconnaissance aircraft that can be powered by either Junkers or BMW jet engines. • March 1940 It is proposed that 20 prototypes of the P.1065 should be built, to be powered by the BMW P.3302. • August 1940 Alexander Lippisch’s DFS 194 flies under rocket power for the first time. • September 22, 1940 Glide tests are begun on the first completed airframe of Heinkel’s He 280 design. • December 1940 The prototype BMW P.3302 V1 jet engine is run for the first time. • Winter 1940 Work on the first prototype of the rocket-powered Messerschmitt Me 163, a development of Lippisch’s DFS 194, is completed. • February 1941 Construction of the first prototype Messerschmitt P.1065 begins. • March 30, 1941 The Heinkel He 280 V2 flies under its own power for the first time. • April 8, 1941 Messerschmitt’s P.1065 is given an official RLM designation – Me 262. • April 18, 1941 The Me 262 V1, PC+UA, makes its first flight, albeit powered by a Jumo 210G piston engine. • Spring 1941 Unpowered flight testing of the Me 163A V1 prototype begins. • July 14, 1941 Following the invasion of the Soviet Union, Hitler issues Führer Directive No. 32 (Supplement), restricting the allocation of non-war-essential military equipment development contracts. Work on new jet fighter types for the Luftwaffe comes to a halt. It is anticipated that victory in the East will be swift. • August 13, 1941 First rocket-powered flight of Me 163A V1. • October 24, 1941 Arado has finally come up with a concrete proposal for the RLM’s bomber/reconnaissance jet requirement – the E.370/IVa. It is examined by the RLM and an initial batch of 50 aircraft are ordered. • November 1941 Two BMW P.3302 prototype engines are delivered to Messerschmitt for installation in the Messerschmitt Me 262 V1 prototype. • December 1941 Design work starts on a production version of the Me 163A, which is deemed too complicated for series production. This will be designated the Me 163B. • February 1942 Arado’s E.370 design is allocated the official RLM designation Ar 234. • March 25, 1942 A first jet-powered flight of the Me 262 V1 is attempted but ends in failure after both its BMW engines fail. • April 1942 The RLM orders six Ar 234 prototypes. Work on the first prototype Me 163B is completed. • May 26, 1942 First glider flight of the Me 163B V1. • May 29, 1942 The RLM reduces its Me 262 prototype order to just five examples. • July 5, 1942 Flight testing of the He 280 V3, using two of Von Ohain’s HeS 8A jet engines, begins. • July 18, 1942 Me 262 V3 flies for the first time with Jumo 004 engines. It completes 25 minutes of trouble-free flying. • September 1942 Although Me 262 V3 has been wrecked in an accident, its reliable performance convinces the RLM to reinstate the type’s formerly cancelled additional prototypes. • November 5, 1942 Focke-Wulf produces drawings for a jet-engined Fw 190, using a powerplant of its own design. • November 18, 1942 The RLM reduces its He 280 prototype order to just six examples plus one unpowered aircraft for high speed testing. • December 10, 1942 With the tide of battle in the East turning against Germany, and with no imminent victory in sight, Erhard Milch orders into effect “an urgent development and production programme under the code word Vulkan. The programme encompasses jet-propelled aircraft and guided missiles, including associated equipment and the ground organisation necessary to support these activities”. The aircraft given top priority for procurement of equipment are the Me 163, Me 262, He 280, Me 328 and Ar 234. • December 28, 1942 The RLM increases its order for Ar 234 prototypes from six to 20. • January 4, 1943 Focke-Wulf designer Julius Rotta sets out how the company will approach future jet design and suggests an aircraft layout similar to what will eventually be produced as the Heinkel He 162. • January 22, 1943 At an RLM conference, Willy Messerschmitt proposes a jet-propelled version of the Bf 109, the Bf 109TL – which would bring together the fuselage of the Me 155 high-altitude fighter and the wing and undercarriage of the Me 309, both projected successors to the Bf 109 itself. • March 9, 1943 The RLM decides against series production of the Heinkel He 280 – primarily due to the minimal ground clearance of its low slung engine pods. This is officially confirmed in a letter to Heinkel dated March 27, 1943. • May 22, 1943 General of Fighters Adolf Galland flies the Me 262 at Lechfeld. • May 25, 1943 Galland convinces Hermann Göring to have Messerschmitt drop its latest proposed Bf 109 replacement, the Me 209, in favour of all-out production of the Me 262. • June 22, 1943 Messerschmitt’s plan for series production of the Me 262 is approved. • Early summer 1943 The first Ar 234 prototype is completed and taxiing trials begin. • June 24, 1943 First rocket-powered flight of the Me 163B V1 prototype. • July 30, 1943 The Ar 234 V1 is successfully flown for the first time. • August 17, 1943 Me 262 production is delayed when a US bombing raid destroys fuselage construction jigs at Messerschmitt’s Regensburg plant, prompting the firm to move key departments to Oberammergau in the Bavarian Alps. • January 1944 The first production batches of Me 163B-0 and B-1 airframes are completed but no engines are available. • March 1, 1944 The Jägerstab (Fighter Staff), a committee of industrialists and RLM officials is established with the goal of reinvigorating Germany’s flagging aviation industry. This effectively ends the RLM’s direct involvement in aircraft production, allowing it to focus on research and development. • Spring 1944 A requirement is issued by the RLM for a simple, quick and cheap to mass produce interceptor that is easy to fly and can be launched in large numbers to protect key targets from bombing raids, under the designation ‘Verschleissjäger’ or ‘Attrition Fighter’, as in swarms of these machines ‘wearing down’ the enemy’s bombers. • June 1944 The first 20 pre-production Arado Ar 234B-0 aircraft are delivered. • Early July 1944 The Jägerstab issues a requirement for a new fighter aircraft, a ‘1-TL-Jäger’. It must be powered by a single jet engine and four firms, Blohm & Voss, Focke-Wulf, Heinkel and Messerschmitt, are invited to submit tenders. The design must be ready to present within eight weeks – by early September – with a mock-up ready a month later, a prototype ready to fly by December 1, 1944, and series production commencing on January 1, 1945. • September 8-10, 1944 A meeting is held at the Messerschmitt facility in Oberammergau where the four firms invited to tender for the ‘1-TL-Jäger’ requirement of July are supposed to present their initial designs for assessment. The Blohm & Voss submission is deferred since it is not yet ready. Focke-Wulf’s design is largely rejected and Junkers is invited to submit designs for the requirement, bringing the number of firms now involved to five. • September 10, 1944 Just as the ‘1-TL-Jäger’ meeting draws to a close, the RLM invites Arado, Blohm & Voss, Fieseler, Focke-Wulf, Heinkel, Junkers, Messerschmitt and Siebel to tender submissions for a new requirement designated ‘Volksjäger’ or ‘People’s Fighter’. This calls for a lightweight fighter built from existing components and powered by a single BMW 003 jet engine. • September 14-15, 1944 A meeting is held at the RLM’s offices in Berlin and five of the firms invited to tender for the ‘Volksjäger’ requirement present their designs – Arado, Blohm & Voss, Focke-Wulf, Heinkel and Junkers. Messerschmitt refuses to offer any designs while Fieseler and Siebel are unable to come up with anything suitable in the four days allowed. The Arado, Focke-Wulf and Junkers designs are quickly rejected. • September 15, 1944 A new main development committee, the Entwicklungs Hauptkommission (EHK), led by Luftwaffe chief engineer Roluf Lucht, is established by Germany’s minister for war production, Albert Speer, to oversee work on new aircraft types. Among its members are Focke-Wulf chief designer Kurt Tank, Willy Messerschmitt, Walter Blume of Arado and Heinrich Hertel from Junkers. • September 17, 1944 Another meeting is held to discuss the two ‘Volksjäger’ finalists – Heinkel’s P.1073 and Blohm & Voss’s P.211. No decision is reached. • September 19, 1944 Yet another meeting is held to discuss the ‘Volksjäger’ finalists is held and all the original entries are reviewed – along with new entries from Fieseler, Focke-Wulf, Junkers and Siebel. • September 23, 1944 Hitler orders Heinkel’s P.1073 design into mass production. • October 3, 1944 Heinkel’s P.1073 is given the official RLM designation He 162. • October 25, 1944 Work begins on the first He 162 prototypes. • November 28-29, 1944 Submitted designs for the ‘Verschleissjäger’ requirement are reviewed. None of the four finalists are rejected but they are ranked in the following order: Messerschmitt’s rocket-enhanced Me 262, Heinkel’s ‘Julia’, the Junkers/Messerschmitt 8-263 and Bachem’s Natter. • December 1, 1944 The He 162 M1 (V1) is finished and ready to fly. • December 6, 1944 He 162 M1 flies for the first time. • Early December, 1944 Junkers submits a new design for the ‘Verschleissjäger’ requirement, the EF.127 ‘Walli’. • December 10, 1944 The He 162 M1 is destroyed during testing, killing its pilot. • December 15, 1944 Discussions take place at the RLM in Berlin regarding the five companies’ submissions to the ‘1-TL-Jäger’ requirement. The companies present their updated designs – Junkers presents its EF.128 for the first time – but no agreement can be reached on the system of calculation that will be used to compare their projected performances. • December 19-20, 1944 During a meeting of the main design and development commission Willy Messerschmitt states that his company will henceforth no longer be involved in the development of Otto engine fighter except developments of the Bf 109. • December 22, 1944 The He 162 M2 is flown for the first time. At a meeting, the ‘Verschleissjäger’ designs are reviewed again and the Messerschmitt/ Junkers 8-263 is chosen for further development. Development of the rocket-enhanced Me 262 is to continue, work on Junkers’ EF.127 ‘Walli’ is to be suspended and both Bachem’s Natter and Heinkel’s ‘Julia’ are to be cancelled. • January 12-15, 1945 Further discussions take place at the RLM in Berlin regarding the five companies’ submissions to the ‘1-TL-Jäger’ requirement. A mathematical formula for comparing the submitted designs has now been agreed but none of the submitted designs now comes close to meeting the amended requirements. • January 27, 1945 Technical specifications are issued for the new ‘Schlechtwetter– Tag– und Nachtjäger’ or ‘Bad Weather Day- and Night-fighter’ requirement. • February 9, 1945 The first five production He 162s are completed. • February 22, 1945 Hermann Göring rules that no further piston engined fighters are to be developed. • February 26, 1945 Further discussions take place regarding the Arado, Blohm & Voss, Dornier, Focke-Wulf and Gothaer submissions to the ‘Schlechtwetter– Tag– und Nachtjäger’ requirement. • February 27, 1945 Technical specifications for the ‘Schlechtwetter– Tag– und Nachtjäger’ requirement are altered, making the designs submitted so far inadequate. On the same day, the Luftwaffe pilots fly a He 162 for the first time – He 162 M19. • February 27-28, 1945 Further discussions take place at the RLM in Berlin regarding the five companies’ submissions to the ‘1-TL-Jäger’ requirement. No decision is reached. • March 20-21, 1945 A final discussion takes place at Focke-Wulf’s Bad Eilsen facility regarding the submissions to the ‘Schlechtwetter– Tag– und Nachtjäger’ requirement. 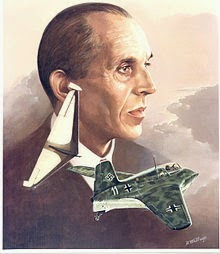 The designs submitted by Dornier and Focke-Wulf are apparently rejected. • March 22-23, 1945 A final discussion takes place at Focke-Wulf’s Bad Eilsen facility regarding the five companies’ submissions to the ‘1-TL-Jäger’ requirement. Junkers apparently receives a development contract for its EF.128 design. • March 31, 1945 Heinkel’s technical design department is evacuated from Vienna, ending work on all projects. On the same day, deliveries of production He 162s to JG 1 finally begin. • April 8, 1945 British forces overrun Focke-Wulf’s Bad Eilsen design facilities, ending work on all projects. • April 29, 1945 American forces overrun Messerschmitt’s Oberammergau design facilities, ending work on all projects. • May 1, 1945 JG1 ferry pilots try and fail to free the last two He 162s from their construction jigs at Rostock before the Heinkel facility is overrun by Soviet troops. • May 3, 1945 British forces overrun Blohm & Voss’s headquarters in Hamburg. It is likely that work on all projects ended some time in mid-April.